Gig/performance archive news for this millenium. September 9th 2018 Co-organiser and participant in Spirit of Ukraine "5" Festival Forty Hall Enfield. September 10th 2017 Co-organiser and participant in Spirit of Ukraine "4" Festival Forty Hall Enfield. January 3rd 2017 Sing Swallow Sing / Shchedryk featured on the BBC. September 10th 2016 Nottingham Ukrainian Centre 25th Anniversary of Independence Celebrations "Stepandry" with Me on accordion, Andriy Maslyaniy on bass, and Yamaha PSR400 on drums. 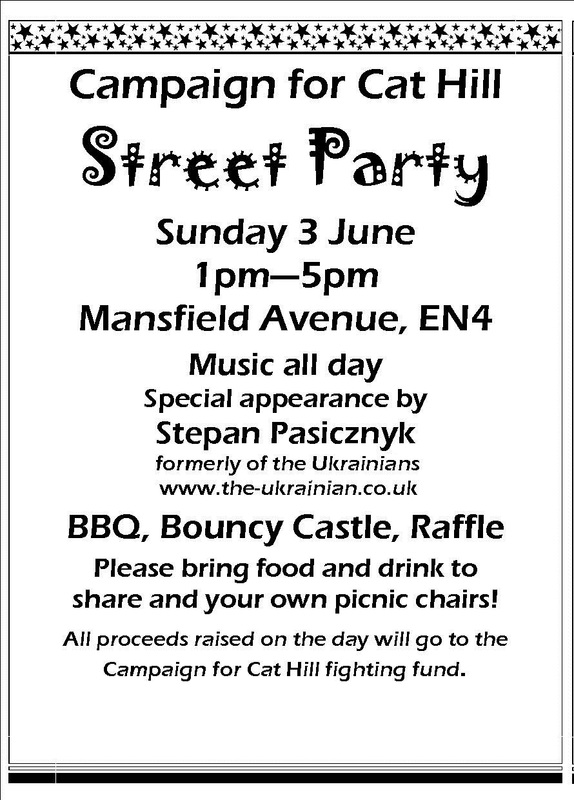 September 4th 2016 Co-organiser and participant in Spirit of Ukraine "3" Festival Forty Hall Enfield. 9th March 2016 A World in London, Resonance FM from 12m.22s. Songs, news about Nadia Savchenko, & my Ukrainian/Irish roots. A World in London, London University SOAS Radio 9th March from 24m. "Eastwind", about Ukrainian and Syrian refugee crises. October 2015 A World in London, Resonance FM 21st , from 6m.12s. An Introduction to Stepan Pasicznyk and his music. November 2014 at Port En Bassin in Normandy & the Norwegian Church venue (Cardiff) with Here Be Dragons. August 2014 Castellano Folk Fest Italy with Here Be Dragons. March 2014 Irlanda in Festa Bologna Italy with Here Be Dragons. June 8th 2013 Cardiff International Arena with Here Be Dragons headlining for the Welsh Beer and Cider Festival. May 11th 2013 with Zhnyva Ukrainian Federation Club in Nottingham. August 25th 2012 With Zhnyva at Tarasivka CYM Summer Camp Bazar Zabava. May & June 2012 Multilingual Euro 2012 song released, donations for Cancer Research UK Press: Barnet Press , Barnet Potters Bar Whetstone and Enfield Times and Luton on Sunday & Luton & Dunstable Express English words here. also played an BBC Radio 3 counties, and BBC Radio Oxfordshire! March 2012 Irlanda in Festa Bologna Italy with Here Be Dragons. November 12th 2011 The Railway Bell Tooting supporting rock band Death Valley Screamers from Ukraine. 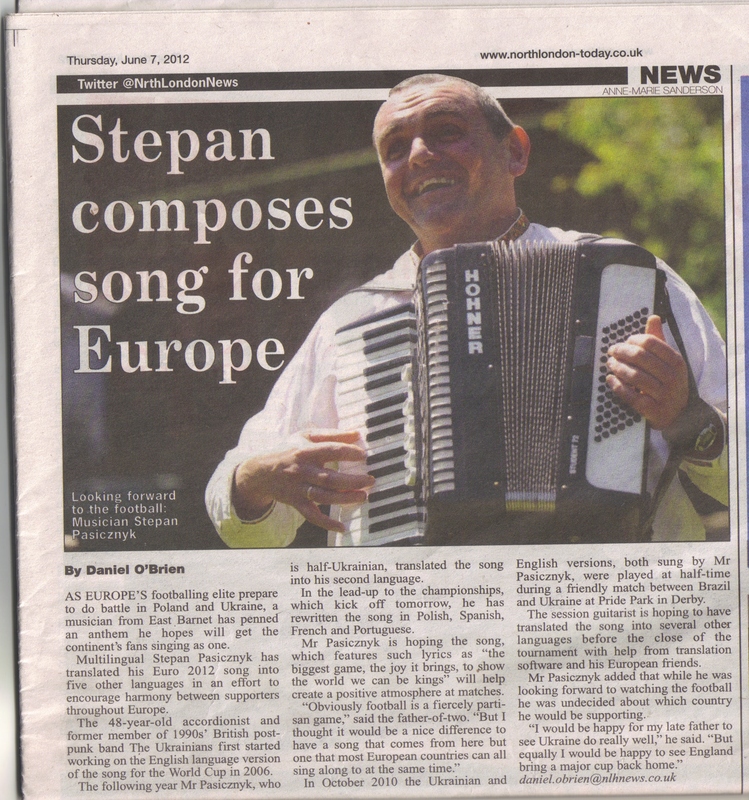 ".........and accordion and guitar virtuoso Stepan Pasicznyk who puts a unique London spin on the music of Ukraine and indeed vice-versa - peerless and fascinating......" (The Miller's write up). March 19th & 20th 2011 Accordionist for Here Be Dragons Lu Monferrato & Bologna, Italy. March 10th 2011 Cambridge University. An evening of music and poetry with distinguished guests in support of Ukraine's longest running Literary Journal Vsesvit hosted by Dr. Rory Finnin, Lecturer in Ukrainian studies at Cambridge. February 18th 2011 Supporting Rob Johnson and The Irregulars at The Miller, London Bridge. August 28th 2010 The Ukes perform at Bazar Music Fest Tarasivka Ukrainian Youth Association Centre in Derbyshire Weston Upon Trent UK. Videos of The Ukes at Bazar 2010 here. Feb 19th 2010 Green Party National Conference Gig at the function Room, The Elephant Inn North Finchley. Dec 12th 2009 Headlined with solo spot for The Green Party's Christmas party The Horse Hospital Venue Russel Square London. May 8th 2009 The Hive formerly Stripes music venue end of football season gig at Brentford FC's own music venue. May 4th 2009 After Rally Party at The Big Chill Venue Kings Cross. April 19th 2009 Another Green Party Fundraiser same venue. March 8th 2009 Green Party Fundraiser gig at Caipirinha Jazz Bar, 177 Archway Road, Highgate, London, N6 5BL, solo set. Feb 28th 2009 "The Ukrainian Experience" hall refurbishment fundraiser gig with Zhnyva at St Josephs Church Waltham Cross. Feb 14th 2009 first CYM dance of the new millenium for newly reformed CYM Waltham Cross at Waltham Cross Ukrainian club Chesunt Herts. My own acoustic set and as accordionist for acoustic set of Here be Dragons. As they have now found a Welsh speaking (and hopefully singing) accordionist my stunt with them is over but we remain friends and I'm all the richer for having learnt some Welsh music! Great fun, and thanks Mike for lending your support to the noble cause! April 13th 2008 The Jamm, Brixton. Feb 2008 (Feb 10th I think) Solo set, The Hive formerly Stripes, Brentford. September 28th 2007 Bagnocavallo, Italy -Festa Di San Michele with Here be Dragons. WGN9 and ABC 7 US TV Interview and live performances. September 5th 2007 BBC London 94.9 fm The Late show with Jumoka Fashole. August 18th 2007	Mescolanze Festival, Trento, Italy, with Here Be Dragons. I've always wanted to be involved in music related to my Celtic side, so when a Welsh band asked me if I would play accordion with them, I obliged. Saturday 18th August 2006, The Ukes played a private function at the exclusive	St. Stephens club in St James, London, which reminds me, we've also done the equally exlusive Oriental Club Marble Arch some time earlier, but I cant remember the date. Saturday July 15th 2006 Ukrainian Social Club, Holland Park London, Ukrainian wedding gig with long time friends and associates Zhnyva . An interesting clientelle cross over, Ukrainian traditional meets Heavy Metal Communities event where the bride groom is a member of Decentmetal. Delivered Zhnyvas speciality, a mix of Ukrainian trad and English language pop/rock covers. Having done accordion on their latest release, "Elvis Lives Here"I supported Swill and The Swagger Band at The Hive, formerly Stripes , and then sessioned with his band for his set. Gig archive here. With Zhnyva. British & Ukrainian Government & business function. Greiz Shloss Fest South Eastern Germany. BBC Ukraine interview with Oleksander Hryb and airplay of Razom Nas Bahato (Tut na Diyaspori). Stripes in Brentford west London, solo spot supporting Swill of The Men they couldnt hang at Stripes , nearest tube South Ealing, West London. Toronto 11th to 13th June 2004. Friday 11th June Warm up gig in Trembita Ukrainian Club in Toronto. Saturday 12th June Promo night at Golden Lion Ukrainian premiere nightspot in Toronto. Excerpts of Rokovyny CD played Sunday 13th June. Headlined at Fest Ukraine Paramount Canada's Wonderland, The Canadian equivalent of Euro Disney or Florida's Disney. Other acts included Ron Cahute of Burya, Vasyl Popadiuk, world famous Classical Violinist from Ukraine, Brian Potvin of top Canadian Indie band "The Northern Pikes", and The Canadian Bandurist Capella under the directorship of world famous Bandurist Victor Mishalow. This event was also host for Miss Fest Ukraine Pageant, the winner of which automatically goes on to compete in Miss Canada. After gig party involved a few drinks and an impromptu performance from an impromptu duet, myself and Orest Khemiy on keyboards, original drummer from Braty Hadyukiny. Germany, July 13th 2002 "The Ukes" first ever gig, Forst, near Hannover.